For other uses, see Humbug (disambiguation). "Bah! Humbug!" redirects here. For the character who says this, see Ebenezer Scrooge. Look up humbug in Wiktionary, the free dictionary. An 1850 cartoon of Jenny Lind outside P. T. Barnum's New American Museum, New York City, 1850, captioned as a "Panorama of Humbug". Humbugging, or raising the Devil, 1800. 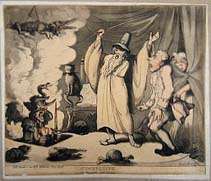 Rowlandson’s humbugging depicts the public as a credulous simpleton being distracted by a display of “the miraculous,” the better to have his pockets picked. A humbug is a person or object that behaves in a deceptive or dishonest way, often as a hoax or in jest. The term was first described in 1751 as student slang, and recorded in 1840 as a "nautical phrase". It is now also often used as an exclamation to mean nonsense or gibberish. When referring to a person, a humbug means a fraud or impostor, implying an element of unjustified publicity and spectacle. In modern usage, the word is most associated with a character named Ebenezer Scrooge, created by Charles Dickens in a book called "A Christmas Carol". His famous reference to Christmas, "Bah! Humbug! 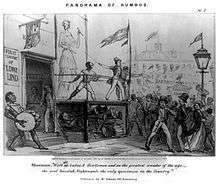 ", declaring Christmas to be a fraud, is commonly used in stage and television versions of A Christmas Carol and also appeared frequently in the original book. The word is also prominently used in The Wizard of Oz, in which the Scarecrow refers to the wizard as a humbug, and the wizard agrees. Another use of the word was by John Collins Warren, a Harvard Medical School professor who worked at Massachusetts General Hospital. Dr. Warren performed the first public operation with the use of ether anesthesia, administered by William Thomas Green Morton, a dentist. To the stunned audience at the Massachusetts General Hospital, Dr. Warren declared, "Gentlemen, this is no humbug." The oldest known written uses of the word are in the book The Student (1750–1751), ii. 41, where it is called "a word very much in vogue with the people of taste and fashion," and in Ferdinando Killigrew's The Universal Jester, subtitled "a choice collection of many conceits ... bon-mots and humbugs" from 1754; as mentioned in Encyclopædia Britannica from 1911, which further refers to the New English Dictionary. Charles Godfrey Leland mentions the idea that the word could be derived from the Norse word hum, meaning 'night' or 'shadow', and the word bugges (used in the Bible), a variant of bogey, meaning 'apparitions'. The Norse word hum mentioned, or hume, actually means 'dark air' in Old Norwegian. From the other Scandinavian languages based on Old Norse, there is húm in Icelandic which means 'twilight', hómi in Faeroese which means 'unclear', and humi in Old Swedish which means 'dark suspicion', documented back to 1541. From this word is also derived the Swedish verb hymla, still in use, which means 'to conceal, hide, not commit to the truth'. According to the Dictionary of the Vulgar Tongue by Francis Grose, 1731–1791, to hum in English indeed originally meant 'to deceive'. To combine this early medieval Scandinavian word with bugges from the English Bible of a later date may seem far-fetched. The word bug is derived from the Middle English Bugge (of which the term bogey is also derived) which is in turn a cognate of the German word bögge (of which böggel-mann ("Goblin") is derived) and possibly the Norwegian dialect word bugge meaning "important man". The Welsh Bwg ("ghost") could also be connected, and was thought in the past to be the origin of the English term however more recent studies indicate that it is a borrowing from the much older Middle English word. Also, with bug meaning ghost or goblin, the use of the term applies in Dickens' novel about the Christmas ghosts. In Etym. Diet. of 1898, Walter Skeat also proposed a similar theory, although using contemporary versions of the words, where hum meant to murmur applause, and bug being a spectre. It could also come from the Italian uomo bugiardo, which literally means 'lying man'. There was considerable Italian influence on English at the time (e.g. Shakespeare's numerous Italian-based plays, approximately 150 years before the first recorded use of 'humbug'). Uim-bog is supposed to mean 'soft copper' in Irish, worthless money, but there is no evidence of a clear connection to the term. The 1911 Encyclopædia Britannica also suggests that it is a form of "Hamburg", where false coins were minted and shipped to England during the Napoleonic wars, which is inaccurate as the Napoleonic wars were 50 years after the word first appeared in print. A modern conception is that it actually refers to a humming bug—i.e. something small and inconsequential, such as a cricket, that makes a lot of noise. In Norton Juster's novel The Phantom Tollbooth, there is a large beetle-like insect known as the Humbug, who is hardly ever right about anything. The word has been used outside of anglophone countries for well over a century. For instance, in Germany it has been known since the 1830s, in Sweden since at least 1862, in France since at least 1875, in Hungary, and in Finland. ↑ "Definition of Humbug". Merriam-Webster. Retrieved 3 August 2012. ↑ Collins. "Definition of Humbug". Collin's Dictionary. Retrieved 3 August 2012. ↑ Dana, Richard Henry Jr. (1840). Two Years Before the Mast. When there is danger or necessity, or when he is well used, no one can work faster than he; but the instant he feels that he is kept at work for nothing, or, as the nautical phrase is, 'humbugged,' no sloth could make less headway. ↑ Bennett, William (1984). "The Genealogy of Mass General". American Heritage Magazine. 35 (6). Retrieved 2014-03-20. ↑ "1911encyclopedia.org". 1911encyclopedia.org. 2006-08-25. Retrieved 2011-12-10. ↑ "Svenska Akademiens ordbok s.v. Hum". www.saob.se. Retrieved 2016-11-29. ↑ "'Svenska Akademiens ordbok s.v. Hymla". www.saob.se. Retrieved 2016-11-29. ↑ "Dictionary of the Vulgar Tongue". Retrieved 2011-12-10. 1 2 "Online Etymology Dictionary". Etymonline.com. Retrieved 2011-12-10. ↑ "1911 Encyclopedia s.v. Humbug". 1911encyclopedia.org. Retrieved 2011-12-10. ↑ "Factmonster". Factmonster. Retrieved 2011-12-10. 1 2 "1911 Encyclopedia". 1911 Encyclopedia. 2006-08-25. Retrieved 2011-12-10. ↑ "word-detective". word-detective. 2004-01-25. Retrieved 2011-12-10. ↑ Horst Conrad. "etymologie.info". Etymologie.info. Retrieved 2011-12-10. ↑ "Svenska Akademiens ordbok s.v. Humbug". www.saob.se. Retrieved 2016-11-29. ↑ "Dictionnaire de la Langue Francaise, Littré 1872-1877". www.littre.org. Retrieved 2013-07-22.